It takes only a minute to get a crush on someone, an hour to like someone, a day to love someone and only takes a one text message to express that feeling inside your heart. Check out this collection of cute and romantic Love Text Messages and Love Quotes SMS that you can also share with. If you have your own favorite Love Text Messages and Love Quotes SMS, we would love to hear it, simply add a comment below or just email it to us with a subject: love text. Hope you'll like it! no matter how GREAT it is..
Wat f d risk s 2 big 2 take? u cn say "i'l catch d nxt 1.."
coz dis joyryd passes jst once. Dnt b afraid 2 tke chances..
d ryt prson bt its a mttr of..
“..being d ryt prson 4 d 1 u choose 2luv. I am lukin 4 d wrOng prsOn.. 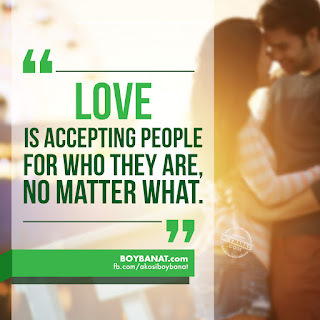 If you have you own favorite Love Text Messages, feel free to share it with us and we will be delighted to have them featured here at www.boybanat.com. Let us inspire more readers. For more reads and updates, you can also visit and Like our Facebook Page (www.fb.com/akosiboybanat).